As a Founding Member at Medium with almost four decades of experience as a practicing physician and a hospital management professional, Dr Sarma has been a key resource for virtually all engagements at the firm. For almost a decade, she was the Medical Superintendent at Apollo Hospital, Hyderabad, where she led a number of performance improvement initiatives. Later as the Chief Medical Administrator at Prathima Institute of Medical Sciences, she played a key role in establishing a medical college and a teaching hospital at Karimnagar, Telangana. 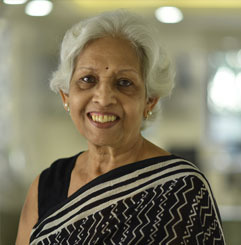 Her earlier experience for almost twenty years was with leading organizations such as RK Mission Hospital, Gandhi Medical College and Essential Medical Services, Hyderabad. A doctor from NRS Medical College, Kolkata, Dr Sarma has wide exposure to healthcare practices in the US as well.